Zen Studios just sent over the first details and trailer for the Star Wars Pinball downloadable content, which will be released soon across most of the Zen Pinball platforms. The first DLC pack in the new collection will consist of three tables, however, today’s reveal is completely focused on the Star Wars Episode V: The Empire Strikes Back table. The Empire table looks beyond fantastic, so it’s best just to get the bad news out of the way first — this is not exactly the best Star Wars voice acting that has ever been recorded. Yoda sounds decent enough, but Luke and Darth Vader leave a lot to be desired. Speaking as someone who has played (and greatly enjoyed) almost all of Zen Studios’ various licensed pinball tables over the years, this is by far the worst voice acting I’ve heard in one of their tables. Voice acting aside, everything else looks incredible and Zen seems to have included all the key points from Empire Strikes Back. 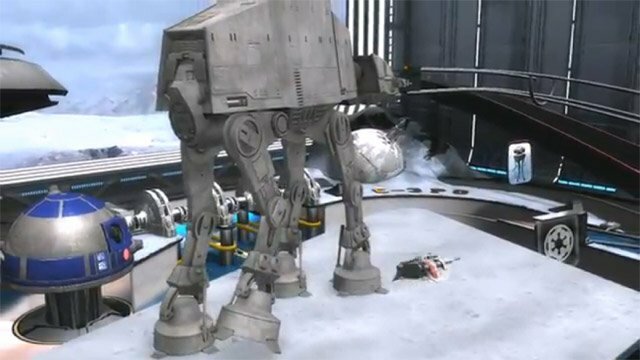 The table includes full 3D models of an AT-AT (with circling Snow Speeder), a Tie Fighter, the Hoth Ion Cannon, and the dueling Luke Skywalker and Darth Vader (spoilers, he is Luke’s father). Missions can be activated while playing The Empire Strikes Back table by hitting the center bank and collecting the letters Star Wars. Once spelled out you can then select which of the five scenes to start, at which point the Executor makes the jump to hyperspace and brings up planet where the scene takes place. Completing all five missions allows players to jump into the epic battle between Luke and Darth Vader. Zen Studio also revealed that the Empire table in Star Wars Pinball features a new checkpoint system that saves your progress during missions. If you happen to run out of time, or experience a ball drain during a mission, the checkpoint kicks in and the next time you start the mission you can pick up where you left off. Check out the Star Wars Pinball Episode V: The Empire Strikes Back trailer below, and look for the reveal of the Boba Fett table next week.